Parallels is best known to Mac users as one of the handful of companies—including VMWare and a couple of others—that make apps enabling you to run Windows on your Mac. Now the company is entering a much more crowded niche: Its new iOS app Parallels Access lets you connect to a remote Mac from your iPad and so "run" Mac apps on your tablet. In doing so, it joins the likes of GoToMyPC, LogMeIn, TeamViewer HD, and SplashTop Remote Desktop, as well as VNC clients like Mocha VNC, among many, many others. So if Parallels Access isn’t exactly unique in what it does, how does it expect to differentiate itself in that crowded field? 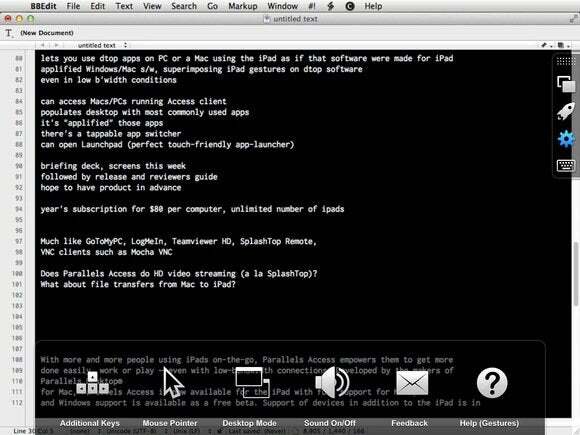 By making remotely accessed Mac programs act as much like native iOS apps as possible. Based on my preliminary testing with the app, here’s how it works. Installing Parallels Access is a simple, two-step process. First you install an iOS client via the App Store. From that client app, you log into your existing Parallels account or create a new one. You then install a Mac “agent” on your desktop or laptop and log into that same account from there; the Mac app must be running in order for the remote access to work. (The Mac installer is smart enough to check your system’s sleep settings and advise you whether you need to adjust them; if your Mac goes to sleep while you’re remotely accessing it from your iPad, you’ll be out of business.) There’s an Access agent for Windows machines, too, so you can control those from your iPad as well. With those two bits of software in place, you launch the iPad app, which will then show you a list of the Macs that are registered to your account. When you launch the iPad app, you first select the remote Mac you want to connect to. 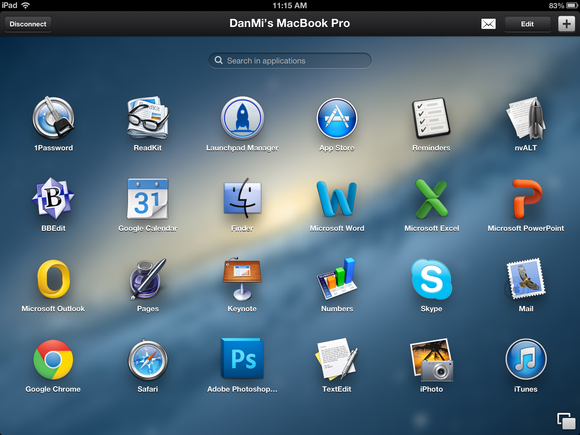 After you connect to a remote Mac, Parallels Access shows you a Launchpad-like home screen of that Mac's apps. Parallels says that, by default, this initial list shows the Mac apps you use most commonly, but you can add and delete apps as you see fit: Just tap the Edit button in the upper right corner to delete or the plus-sign (+) to add. There’s also a handy search field, which will find any app with your search string, not just those on that default home screen. When you tap on one of the icons on that home screen, the Mac app opens smoothly; I noticed no lag between my taps and the app’s response. (That’s not always the case with this kind of remote access.) If you were near the Mac you’re connecting to, you’d see the app open in full-screen mode on your Mac’s display(s). 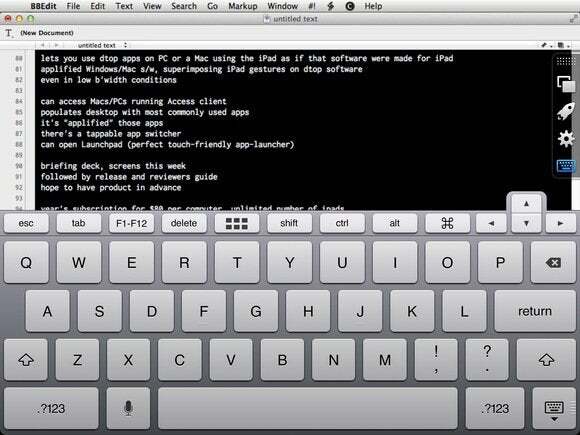 You could type and move the cursor from your Mac input devices, but the interface would be zoomed in on the one app that’s open on your tablet. Access isn’t just mirroring your Mac’s screen on your iPad: It’s overlaying its own interface on your OS X apps. That means you interact with Mac apps by tapping, tapping-and-holding, clicking, dragging, and so on. A regular one-finger tap on the iPad produces a single left-click on your Mac, a two-finger tap creates a right-click, a slide of your finger scrolls the screen, and so on. On the right side of the screen, you’ll see a small toolbar with four icons on it. You can swipe over the toolbar left-to-right to hide it, then swipe in from right edge of the screen to have it reappear. On the right side you get the Access toolbar; at the bottom, there's the app-switcher. The top icon on that toolbar summons a Dock-like interface at the bottom of the screen, showing all of the apps that are currently open on your Mac. To switch to another app, you tap its icon there. Below that on the toolbar there’s a Launchpad icon; you use that to summon that initial home screen with your Mac app icons; you can open new apps there. The Settings bar along the bottom summons special keys or mouse pointers, expands the workspace, and more. Finally, below that Settings icon, there’s a keyboard button that summons the Access keyboard. That keyboard is the standard iOS one, plus a set of special keys at the top: Escape; Tab; F1 through F12 keys; Delete; a button with a grid-like icon on it that, when tapped provides Home, End, PgUp, and PgDn keys; Shift; Ctrl; Alt; Command; and cursor arrow keys. Access adds a row of special buttons on top of the standard iOS keyboard. The Access keyboard doesn’t let you “chord” keys—in other words, you can’t use standard OS X keyboard combinations such as ⌘-B, ⌘-C, and so on. Instead, you must use the iOS-standard context menu (summoned by selecting text or whatever else you’re working on, depending on the app, then tapping the selection). On the plus side, you can use iPad dictation for input in your Mac apps. Because you’re running OS X, you can run multiple apps at once, switching from one to the other using that app-switcher button in the toolbar. But because you’re in iOS, the Access interface is really optimized for running one app at a time. So if you need to hop among multiple apps, the Access interface could be frustrating. Tapping on elements of an app’s interface—buttons in the Office ribbon, for example—works really well, in part because Parallels intelligently interprets taps that are close to buttons; you don’t have to hit them exactly. While Parallels Access does indeed provide a nice, smooth iOS interface to Mac programs, that’s not to say the app does so uniquely enough to clearly distinguish itself from the other iPad apps that do much the same thing. For that final word (as well as word on whether and how well you can stream video or transfer files from your Mac to iPad), you’ll have to wait for our review. Parallels Access will sell for an $80 annual subscription; you’ll need a separate subscription for each Mac (and PC) agent you install.